In 2015, it was announced that the Met Office had lost the contract to provide the BBC’s weather for the first time since forecasts started in 1922, with the contract instead going to MeteoGroup. 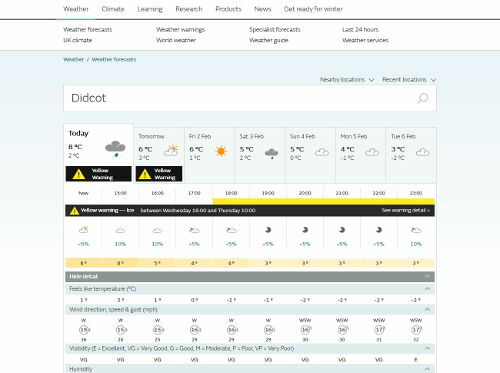 Towards the end of last year, it was announced that MeteoGroup were behind schedule in their work towards providing the BBC’s forecasts, so the contract with the Met Office had to be extended until March. This week, I discovered that the BBC Weather website looked different in one of my browsers. They must be selecting people at random to try the new MeteoGroup-powered website. 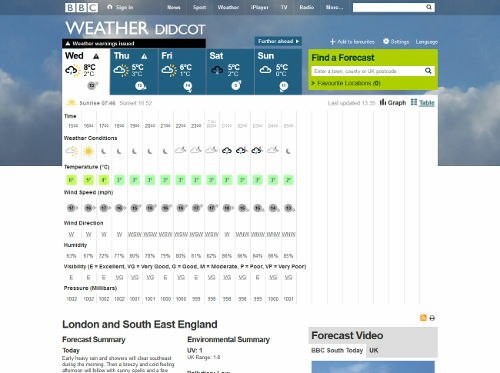 Not only is the data provider changing, but it seems the BBC have taken the opportunity to tinker with the layout of their weather pages. The new page has a wider layout with an updated look and feel. As is now increasingly common in an era when people are switching to tablets, the page is shorter, to avoid the need to scroll on a landscape screen. One thing that is immediately noticeable is the lack of colours indicating the temperatures throughout the day. The BBC tried to remove these in a previous update in 2011, and ended up having to add them back after “user feedback”. In fact, the colours are present in the new layout for the daily average temperatures, but as far less prominent stripes of colour below the daily forecast (or above the currently selected one). The colours are, however, not used at all for the hourly temperatures, a reversal of the previous situation. Another change is that there is no longer an option to switch between “graph” and “table” views, with the graph view forced on everyone. I happen to prefer the view with the temperatures lining up, but this choice has been taken away. Details such as the humidity and pressure were previously only visible on the five-day forecast page in table view, so these are currently missing. Thankfully, the BBC has retained its classic weather symbols on the new page. The wind speed indicators have switched to a circular outline rather than filled circles. There is also a new symbol and a percentage, showing the probability of rain during that hour. The new layout looks OK, but they really need to bring back the colours for all the temperature values, and also the option of table mode with all the old data. But how about the quality of the new forecasts from MeteoGroup? Clearly, it’s too early to say how accurate the forecasts will be from the new provider. Having said that, on the day I took the screenshots above, MeteoGroup said the next hour’s weather would feature hail showers. The Met Office’s version predicted sunny spells. Out of the window: nice and sunny. While I realise it’s not exactly a thorough comparison, it’s possibly not the best of first impressions of the MeteoGroup forecast. The Met Office site also carries advertising, despite being a .gov.uk branded site. 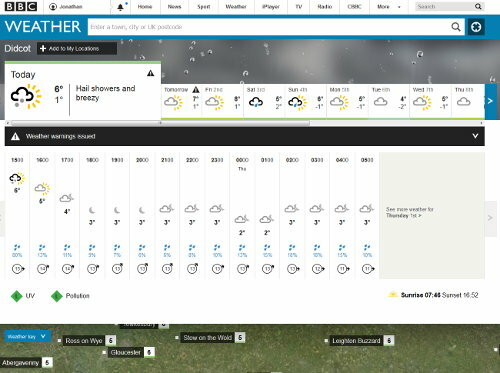 The BBC, of course, never features advertising, so we have the slightly bizarre situation of being able to view a forecast from the private MeteoGroup free of advertising, or a forecast from the UK Meteorological Office complete with adverts. I feel some sort of Greasemonkey script or similar is in order to restore the perfect weather page. How about the new BBC page but with colours; or the Met Office page with the BBC’s symbols and colours? The numbers used for the image filenames on the Met Office site are identical to those on the old BBC site, ranging from 0 for a clear sky at night, to 31 for a rather alarming-looking whirlwind symbol, which thankfully we do not usually see in UK forecasts. Hopefully, though, no hacking will be required, and “user feedback” will ensure the best aspects of the old layout will be retained in a way that works with the new data from MeteoGroup. But anyone who tires of spurious warnings of hail showers will know where to look for a second opinion. colour – I don’t have the benefit of numerous browsers enabling you to make the comparison between new and old versions. Another thing I miss on the new BBC site is the barometric pressures which could be found on the “table” format before. The fancy (and enthusiastic) “training” video on the site by Sarah Keith Lucas just irritated me and made me say “some of us don’t want change all the time”. Clearly you have multiple browsers etc. so you must be of working age – I am relieved (as an old woman) to hear that you are irritated too! Sarah asked for comments but I have not yet found a way to do this. I have asked my local (North West England) weather presenter how to do this, but she was not in the studio tonight – she has answered emails before, so I am hoping I might hear later in the week. I have kept daily domestic weather records for years. Weather matter up here – we have twice the rainfall of such places as St Albans and Cambridge. I have already written to BBC Points of View and they do sometimes pass on comments even when they are off air. you will see the Profile Manager. You can create a second profile which will hopefully give you the old weather page again, although I suspect they are slowly switching more and more people over to the new one.